Last week, one of the boxes that NHA sent to Sierra Leone arrived at its destination. There were others that were mailed together with it, but sometimes things are released at different times depending on how the postal workers in Lungi process the shipment. Once the packages arrive in Freetown, the Postal Workers there understand the value of the boxes and the needs of the people and they try their best to get them to James. Last week when the single box arrived in Freetown, the postal worker (a friend to James) took the care to have it delivered to James in Kabala. Box in hand, James set straight out to put the box's contents to use. Squeezed in among the medications in the box was some deer jerky. In villages with no electricity, no form of refrigeration, the jerky is a great source of protein. As James approaches the village, the residents wonder what he is up to and why he is coming their way. He is watched as he steps closer. James begins to pass out the jerky. At first, no one understands. What is this dried out strip this man is giving us? the uncertainty on their face is replaced by a smile. 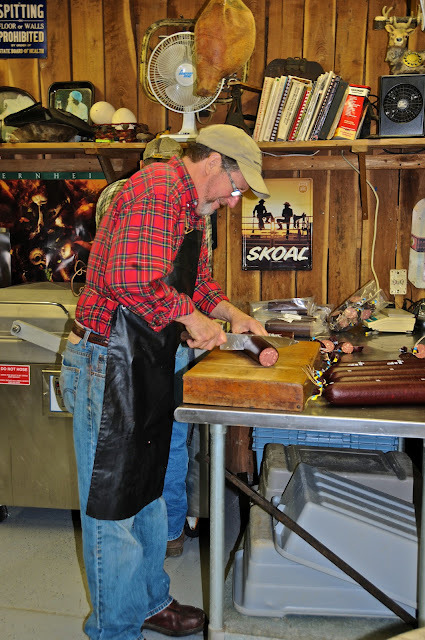 Markwell's Deer Processing for sending the jerky. It certainly is a real treat in Africa. See your donations in action, check back on this NHA Blog often! Let's pray that the remaining boxes arrive soon, there is some extremely important medications - like Roo's Iron pills - in them. Please spread the word, invite your friends to be an NHA Sustainer! Thank you. Labels: Anderson County, Deer Jerky, Hunting Season, Kentucky, Markwell Deer Processing., Nazareth house apostolate, NHA, St. Simeon Skete.